The property is full of character, dating from 1868 and comprised of 5 restored period stone houses guesthouses on a 5,000-sq.m property planted with trees and flowers. The comfortable 4-person guesthouses enjoy a peaceful location in the countryside with a panoramic view over the Bay of Douarnenez and the mountain of Menez Hom. It is close to the well-known traditional Breton village of Locronan. Near the beach of Sainte-Anne-la-Palud, which is 3 km away. Enjoy the peace and quiet of the countryside, all while remaining near the seashore, which is 3 km away. For your entertainment, there is an on-site games room with billiards, table football, ping pong, darts and board games. The property has a private parking space. The location of the house is prfect. Nice old farmhouse with a beautiful large garden. Close to all atractive places in Finistere and to nice and wide beaches. In the clos villages you find everything what you need, even a 2 Michelin stars restaurant, probably one of the best in Brittany. The apartment is big enough for 2 persons or a small family. Forget to go there with friends: there is no isolation between the rooms at all. The "walls" are wooden and very thin. No trsholds under the doorss. You can just hear any slightest noice everywhere. In the main room is onla one lamp over the table with and intensive white/blue ligt. No lamp at all by the sitting area. In all other lamps are the weakest bulbs you can immagine.Beds: mattresses are ok, blankets very heavy and not warming. Bathroom: shower in a vertical plastic tube, not very comfortable. Kitchen: the frig is new and ok, dishwasher looks new, but was defective, microwave ok, te ovrn and cookers old but still usable. WiFi ok, TV with 27 channels, all French.The electical heating was very effective, but also very expensive. We have paid for bed and bathroom linen and expected that it will be changed after some time (we were there for 3 weeks). We had to ask for it after 10 days. Some cuhions for the outside chairs would be nice and the plastic cover on the chairs at the dining table is not very pleasant. The main problem was that the entire appartment was stuck and no ventolation did help. I is obviously some art of mold in the old house. After our return we had to wasch and let dry clean everything we had with. Dificcult with shoes and other leather garmnent. The apartement could be a bijou, bt it is not. Enjoyed our stay very much. Very peaceful. Beautiful setting. Owner extremely helpful. Accomodation comfortable and we had everything we needed. One week in a superb location. The owner very nice and accomodating. Unfortunately we thought the gite facilities, i.e cooking etc was for us quite basic so detracted from overall experience. 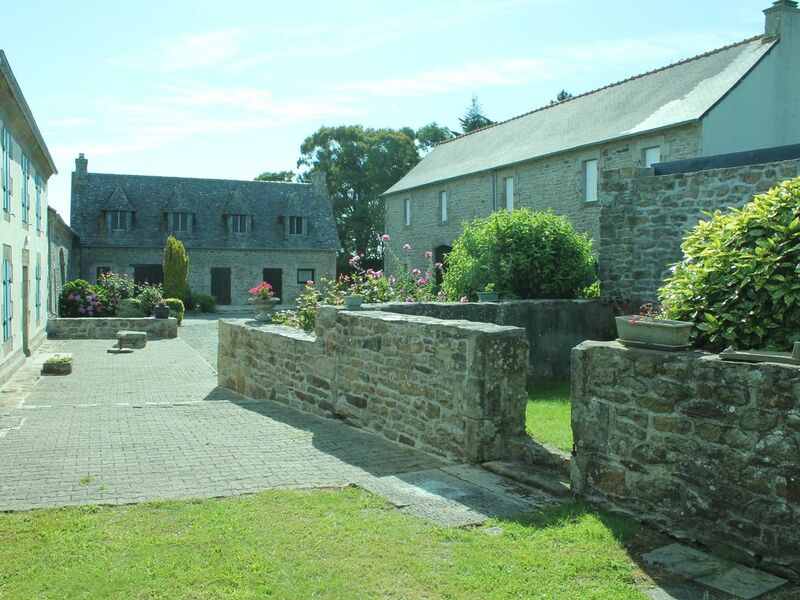 We spent 6 nights in this lovely Gite,close to long sandy beaches and wonderful scenery.The property was well appointed and comfortable, set within an idyllic location and beautiful gardens. Jean-Luc the owner was friendly and helpful with advice about local amenities etc. Always on hand but not intrusive. A wonderful stay. Thank you Jean-Luc. Je suis heureux devoir que des gens sympathiques aient apprécié notre gîte et son environnement et c'est avec grand plaisir que nous vous accueillerons à nouveau. Je vous remercie pour cet agréable commentaire, Nous essayons toujours de faire au mieux pour que les vacanciers passent un agréable séjour. This was our first trip to Brittany, and a special occasion for my 60th birthday wish. We stayed a week at this property, and could not have been happier. It is a lovingly renovated stone farmhouse surrounded by WWII history. We enjoyed immensely the wood paneling, antique furniture and comfortable beds. Though not modern, the kitchen is very functional and we made fabulous meals including boiled lobster, stuffed artichokes and seafood bisque. Jean-Luc, the owner was on premises every day attending to maintenance, and available for any questions or requests. He was unobtrusive but we very much enjoyed our conversations with him. We met his wife on our last day and she was very sweet. The grounds are spacious and park-like with beautiful trees and flowering plants. Our patio had a view of Douranez Bay and the sunset. Our neighboring families in the complex were very nice, and the kids had a wonderful time playing in the large garden area. This was just a beautiful spot, with owners who really care. We had a fantastic time visiting the neighboring towns, the Crozon peninsula, and Foret Huelgoat. All of these places were in close or at least reasonable driving distance. Plonovez-Porzay was an excellent location, and this property was absolutely perfect for our needs. We really hated to leave. Der Aufenthalt im Häuschen hat uns gut gefallen. Der Garten ist etwas ganz besonderes! Mit so viel Liebe gemacht. M. Quere hat uns mit Informationen versorgt und war immer sehr hilfsbereit und geduldig mit unserem nicht so guten französisch. Das Meer und viele interessante Sehenswürdigkeiten sind mit dem Auto von da aus sehr leicht zu erreichen. Das Meer und die Buchten sind dort besonders schön.